First in a brand new thought-provoking space opera series. The lines. No ship can traverse the void without them. Only linesmen can work with them. But only Ean Lambert hears their song. And everyone thinks he's crazy. Most slum kids never go far, certainly not becoming a level-ten linesman like Ean. Even if he's part of a small, and unethical, cartel, and the other linesmen disdain his self-taught methods, he's certified and working. Then a mysterious alien ship is discovered at the edges of the galaxy. Each of the major galactic powers is desperate to be the first to uncover the ship's secrets, but all they've learned is that it has the familiar lines of energy-and a defense system that, once triggered, annihilates everything in a 200 kilometer radius. The vessel threatens any linesman who dares to approach it, except Ean. His unique talents may be the key to understanding this alarming new force-and reconfiguring the relationship between humans and the ships that serve them, forever. "Riveting and fast-paced. LINESMAN is a great read." 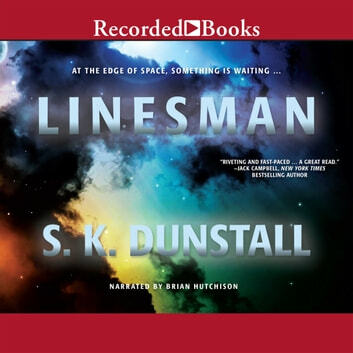 -NYT bestselling author Jack Campbell "Full of fast action, interplanetary intrigue, appealing characters, and a fascinating new take on the idea of the sentient spaceship, LINESMAN is a whole lot of fun to read. I want to hear the ships' lines singing!" -Sharon Shinn, National Bestselling Author of ARCHANGEL.